9-11 of March in Örnsköldsvik there were Swedish National Armwrestling Championship, which gathered 225 sportsmen from 28 teams. “It is truly difficult pick just one fight, but the masters division, both men and women, provided some very entertaining armwrestling, and in many cases the best masters where also among the best in the senior. Elin Janeheim is maybe not a surprise, but she won her first senior gold and impressed greatly in the ladies -60, a category with several world medalists in it. After a few years with slightly lower attendance behind our stars this year there were quite a few new ladies that show great promise for the future. I cannot say that I am disappointed, but there are some categories in the juniors where I would like to see higher numbers. But the seniors are looking very good, and our capacity in the men's division will surprise”. “Yes, Sweden always come to Europeans and worlds, we don't know yet how large the team will be, those qualified now have some time to decide and prepare, you must remember that even though we are very successful every athlete still pays all the expenses themselves. Katowice however is very good to travel to from Sweden, and our athletes are aware of the high standard championships in Poland show, so we believe our team will be big. And strong, very strong”. 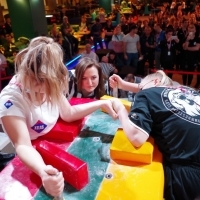 We hope to see professional armwrestling of Swedish team at the Europeans and wish them good luck!